more commonly known as the Brown Scapular. in large quantity for bulk distribution. The colors of the cord used may vary; brown or white. most Scapulars you find are made with both. from your organization will vary. Sometimes the wording is different. it must be worn over the shoulders. as a child of Mary. resemble the supplies shown below. into specified lengths. With others, the Cord is pre-cut. You will also receive a "page" of images which must also be cut into strips, 8 images wide. The images are made of adhesive-backed material which melts and bonds to the wool when heat is applied. You are free to adjust them according to your preference. are necessary to make Brown Scapulars. Scapulars may also be hand-sewn: adjust steps accordingly. Iron the wool if wrinkled, with a cool iron. Warm the iron to wool or silk setting, no steam. Test heat first on scrap image and wool. TIMESAVER: Using quilters tools such as a "self-healing" cutting board, large quilters rulers/straight edge, and a rotary cutter saves time and ensures precise measurements and cuts so your scapulars are always uniform. Lay the wool out on your cutting surface. or measuring with a straight edge (quilter's) ruler. to show the method of cutting each of your wool strips. ensures a precise cut with little fraying. allows room for error and the placement of the cords in later steps. Cut as many strips as needed for each sewing session. Stack strips for later use. it is not necessary to make sure that each are exactly the same length. But if a bolt of cord is supplied, you must lay the cord out and cut into strips 21 inches in length. such as for children's scapulars. Our Brown Scapular Starter Kits indicate cord cut to 19 inches. Cut at the taped edges. no steam. Test heat first on scrap image and wool. is set to keep from overly melting the image. will ooze out around the edges if the Iron is too hot. Adjust heat and test again. Lay a strip of wool on your ironing surface. Lay a strip of images on the wool as shown. the outer edges of the images before ironing. Place the image strip approximately 1/8" from the top of the wool strip. Apply the iron lightly. The image will melt onto the wool. To avoid dark marks created by the iron, use a piece of transparent material as an ironing cloth. PELLON works well for this step. Iron over one image at a time to affix cord and image to the wool. Avoid touching the next image with the iron. "Our Lady of Mount Carmel, pray for us! Saint Simon Stock, pray for us!" to melt the images into the wool at the proper adhesion. And it transforms your work into a prayer! Proceed to add cord to each face and word image. checking corners and edges for a firm adhesion. so you can check for proper adhesion. When those 8 are set and cool you will repeat the same steps to complete the other side of your scapulars. with SET B positioned ready to add cord to each image. and position them under the first Face Image on SET B.
lead to the correct image on SET B.
scapular promise words on the other. Make sure the cords lie flat between the two SETS. Affix cords as usual to face and word images of SET B. When both sides of your sets are completed they should look like the picture above. white thread for the top. Use a Sharp, size 14 needle. Smaller sized needles won't work well with the wool. Place your strip set under the needle to sew the top edge. Keep the excess of cords flat and to the left of your work. and the brown line imprinted on the image. Sew straight across the top of all the images. Repeat for the bottom edge of the image strip. sew in a straight line across the top and bottom of Scapulars. Lay your straightedge alongside the bottom of the scapulars in SET A.
but a steady hand and sharp scissors work as well. Cut sides of image strip in a nice finished straight line. Do the same for SET B. Sharp Scissors work best for this final step. Cut to separate both sets into individual scapulars. Brush off any wool lint that may have adhered to the images. 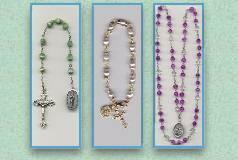 Hold scapulars up and admire your beautiful work! Tie each scapular's cords with a "shoe-lace" bow as shown. The most common mistake made by beginner scapular makers is the incorrect placement of the iron-on patch images. The top of the patches should be facing each other, with the length of cord between them. Make sure those Cords are in the middle! of Our Lady's Scapular Makers. Keep your work as neat and precise as possible. It is a reflection of your love for Our Lady ! a Scapular Maker for Our Lady! 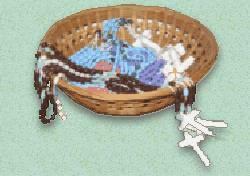 which includes materials enough to make 8 Mission Style Brown Scapulars.